would follow the decision by Wales to lift the restrictions on kava sales. to adverse publicity about health concerns. result of consuming kava-based products. ban, or the restrictions and the market recalls by regulators in Europe. adopted strategies that would help get back kava on the European market. 1. Sam Moroto is almost ready to hold the taro diversity fair is Choiseul. It should be sometime in the next few weeks. Should be very interesting and popular. 2. A banana diversity fair was held last week at Manivovo in Makira where the banana collection is. I will send a report when I have more news about how it went. Nancy went from PMN. Dorothy from PMN may be going to the MGIS training. The bananas from the RGC are all growing well at Burns Creek with the first fruit harvested from one of the varieties last month. We should be ready to start distributing the first few suckers early next year. 3. In North Malaita we have just completed a participatory pest survey as part of the Linking Farmers to Crop Protection networks project involving KGA/PMN/PESTNET and the Ministry of Agriculture and Livestock (MAL). The cooperation with MAL has gone quite well so far with Lilli Wame the coordinator in MAL and she accompanied us on the two weeks of the survey. The farmers identified sweet potato, taro, slippery cabbage and watermelon as the priority crops that they want to look at reducing pest problems on. A series of workshops to share local and outside knowledge on these crops, IPM and plan farmer field trials will be held next year. The first workshop is on taro and will be held in the highland village of Gwaiau in late january. 4. ACIAR is developing a project with James Cook University, Queensland on the domestication and commercialisation of multipurpose indigenous trees and shrubs in PNG. They have been asked to extend the project to Solomons as well. It looks like KGA and Farmer First Network (FFN) partners will have a role in the feasibility study of commercialisation of gnali nuts and participatory domestication work. Talks are ongoing. 5. In Bougainville the PEDC crew have held a number of workshops and started demonstrated gardens at the Nazareth Rehabilitation Centre near Buka which will be a lowland sustainable agriculture site to complement the PEDC mountain work. Bruno and Alphonse from PEDC will come to Solomons to assist with developing a farmer manual on diverse agro forestry using local species. Small scale seed production and the start of a seed network is continuing at Paruparu in central Bougainville. Grahame Jackson has sent on some queries about a devastating disease that is wiping out sago palm trees and spreading rapidly across Bougainville. We are hoping that SPC or NARI will make some kind of assessment very soon. 6. In Tari, Southern Highlands of PNG, Angeline returned home and has started a seed collection and bulking of seeds at the Koli Demonstration Farm. CBHC are interested to further develop a PMN type model for a farmers seed and planting material network. Joseph Warai from CBHC will be in Solomons in December for an FFN meeting. 7. Peter Kaoh from Farm Support Association (FSA) in Vanuatu will also be here in December. We are planning a number of exchanges with Solomons and Bougainville to share FSA experience with spices. In particular, PMN is looking at introducing pepper as an alternative cash crop using FSA experiences. 8. PMN is close to completing field trials of three varieties of sorghum and pigeon pea provided by ICRISAT as part of our animal feed program. The new pigeon peas are being trialed by some PMN members. They have not yet flowered but are growing well. The sorghum varietes are all promising - with open heads, tall plants with a lot of organic matter and all produce multiple harvests. We are also triallying some open pollinated brassicas from AVDRC but that has not been so successful with a number of varieties succumbing to disease before they flowered. A second trial is now starting with Johnson Ladota from the Malaita highlands. Johnson Ladota has actually started the first farmer seed centre, which was one of the recommendations from the conference - to use RTCs and institutions less and concentrate on local networks and farmer run seed centres. 9. One of the issues we will discuss at the December FFN meeting is the formation of an island highlands network, ie places from 300-700 metres altitude on islands. These places have a quite different climate and needs than coastal areas and are often very marginalised, isolated and low income sectors of the community. They have more in common with each other - ie other highland areas, than with nearby coastal communities. So we want to try and build linkages especially looking at crops, varieties and livelihood strategies for these groups of people. Almost all of them are waling access only with very limited services and market opportunities. This regional conference, co-hosted by the Australian and New Zealand Societies for Horticultural Science (AuSHS and NZSHS), features Asian-Pacific horticulture. It is being held in conjunction with the Vth ISHS International Strawberry Symposium (4 to 8 September) as well as biennial meetings of the Board, Executive, and Council of the International Society for Horticultural Science (ISHS) being held from 25 to 31 August. 1. Achieving commercial potential - Case Studies from discovery to commercialisation. 2. Harvesting the genetic potential. 3. Reaching the potential for sustainable horticulture. 4. Building bridges: international collaboration. 7. Sensory and post-harvest technologies. The following news just in from Rosa Kambuou of NARI. The National Agricultural Research Institute (NARI) has officially released the following improved varieties of crop species during the official opening of the NARI Headquarter Building and the re-naming of the Bubia & Labu Research Centre as the Sir Alkan Tololo's Research Centre on 10th November 2003. - 8 sweet potato varieties, 4 for the dry-lowlands (NARI Nambis Kaukau 1 (B11PT), NARI Nambis Kaukau 2 (SI278), NARI Nambis Kaukau 3 (NUG5) and NARI Nambis Kaukau 4 (K9)) and 4 for the highlands selected by the Drought Project for their tolerance to dry conditions, good yields and early maturity. - 4 cassava varieties selected for their high tuber yields, good eating quality and low cyanide contents. The sweet potato and cassava varieties were originally selected from the national germplasm collections. The improved banana varieties were obtained via QDPI from the INIBAP International Musa Testing Programme (IMTP). Steve Waldren, Trinity College, University of Dublin, Ireland, spent a sabbatical studying the vegetation and flora of the Pitcairn Islands, and provides some background and nice photographs here. Two endangered, Vitamin-A rich banana varieties multiplied and distributed. Usr Kulundol (Kosrae)/Uht in Yap (Pohnpei) and Usr Kulasr (Kosrae)/Uht Karat (Pohnpei), two Fe'i banana varieties of the Australimusa series (also known as Musa troglodytarum), have unusually high levels of provitamin A carotenoids, which are precursors to vitamin A. They are also quite rare. There is a severe problem with Vitamin A Deficiency (VAD) in the Federated States of Micronesia (as in other Pacific countries and territories), mainly because of dietary habits. A banana rich in vitamin-A could be a way to effectively combat VAD (see previous postings by Lois Englberger and Adelino Lorens in Pohnpei). The Department of Insular Affairs, USA provided $50K to Kosrae State, FSM to micropropagate and distribute these banana varieties to farmers. The Micronesia Plant Propagation Research Center (MPPRC) in Kosrae implemented the project. 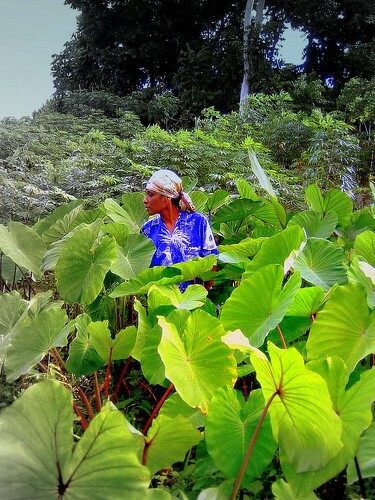 More than 3000 plants were raised through tissue culture from the 18 suckers of Usr Kulasr and 7 suckers of Usr Kulundol that were collected in Kosrae in 2000. The States of Yap and Pohnpei were provided with 300 and 250 plants respectively. The micropropagation project has made these two valuable banana varieties more widely available to FSM farmers and their families, and contributed to their conservation. The USDA, Natural Resources Conservation Service project on tropical crops at American Samoa Community College, Pago Pago, American Samoa, was initiated in 1998. This study provides growth parameter data on tropical crops commonly grown in the Pacific basin area. The study is conducted on land owned and operated by native farmers, and crops are produced in a manner consistent with their usual farm operation. Researchers from American Samoa Community College collect and process the data for use in the RUSLE soil erosion prediction model. Currently studies are being conducted on banana and taro. Upon request of the Government of Papua New Guinea (PNG), FAO is assisting the PNG Forest Authority in the sustainable management and commercialization of eaglewood (Gyrinops ledermanii, also known as agarwood, aloeswood or gaharu) through its Technical Cooperation Programme "Eaglewood Management Project" TCP/PNG/2901(A). Eaglewood is a valuable non-wood forest product that has been commercially exploited in Papua New Guinea for approximately ten years. High external demand combined with low national capacities with regard to eaglewood production and commercialisation has resulted in uncontrolled exploitation and inappropriate trade structures which marginalize local producers. Rough estimates indicate that if unsustainable harvest and trade continue, eaglewood resources in certain areas will be totally depleted by 2005 not only threatening the tree species but also leading to substantial economic losses. The objectives of the 20-month project, which started in October 2003, are (i) to strengthen institutional capacities of technical staff from governmental and non-governmental organizations at the national level and the management capacities of local resource owners and producers at the grassroots level; and (ii) to assist the governmental organizations concerned in the elaboration of a national eaglewood conservation and management strategy. This strategy will be based on the assessment of the ecological and socio-economic impact of eaglewood production and the identification of appropriate processing and harvesting technologies, including inoculation techniques to promote oleorosin production. Collaboration among all stakeholders concerned will be enhanced. · Sustainable management strategies, guidelines and policy measures on eaglewood as part of the eco-forestry policy are formulated. · The extension and regulatory capacity of governmental and non-governmental organizations is strengthened. · Effective training and awareness campaigns on eaglewood management at grassroots level are carried out. · Workable community-based eaglewood management models on customary land in three selected areas are designed and undertaken. · Promising extraction methods are tested. · Cost-effective fungal inoculation techniques adapted to PNG conditions are developed. As a result, it is expected that the assistance will contribute to sustaining the management of eaglewood resources and the livelihood of people using eaglewood resources.